The art of Cosmobilogy is the same philosophy. It is never our intention to sway anyone’s vote, nor pledge political allegiance. When we take a look at an election chart it should speak for itself despite our own political persuasions. I read a chart as I see it so; let us take a look at the recent American elections and see why Cosmobiology got it right. Yes, I was one astrologer who did pick TRUMP. I looked at the candidates and using my system of Cosmobiology it was clear that Trump would win. 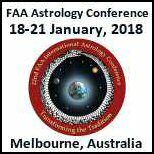 Many thanks to Sam Cawthorn, who runs a protégé Program for public speakers out of Sydney who encouraged me to talk about astrology. I have my prediction on video where I went through various star sign personalities and gave predictions in a ten minute lecture back in September, 2015, and gave Trump the thumbs up. That was 14 months before the election. There were two things in his chart that stood out. 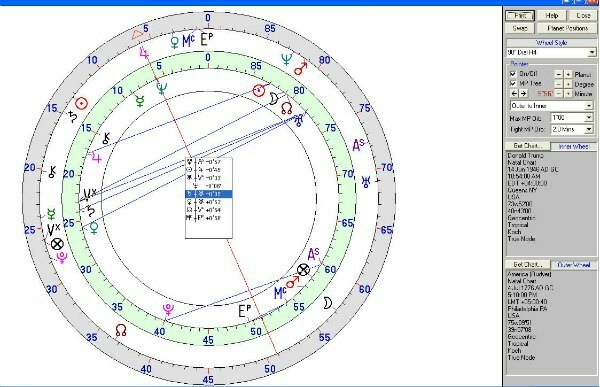 The first thing I noticed was that Donald Trump has 29 degrees of Leo rising on the fixed star Regulus and that often indicates royalty in the chart. For many years Trump has had a very successful career and has risen to the top on more than one occasion so this was certainly a Regulus chart and could take him one step further to become the president of the United States. There is another pattern in his natal chart which can be a difficult to negotiate throughout one’s life and does indicates a great disappointment and this is Venus/Saturn so; was this disappointment not winning the Republican nominee? The native can be brilliant and inspiring but also shows a naïve and impulsive side. Like the fool in the tarot deck this one can discover and explore brave new worlds or fall over in the process. Trump has a fantastic scope of vision, imagination and enthusiasm (Moon in Sagittarius) to keep him busy for a life time but he must learn to control his restlessness and develop discipline to follow through on his promises. There is little this individual cannot do once they have mastered self control and discipline but they need to surround themselves with associates that are disciplined and well-organized. Finally Mercury in Cancer is a bit like Moon in Cancer, these individuals are actually hard wired to home and family despite their indiscretions. Trump has Mars in Leo which is forceful and egotistical but so too has Hilary Clinton. Watching these two performers on stage was very interesting from an astrological point of view. Here were two egos going head two head but both in different directions. No wonder the 2016 US election became the greatest show on earth. 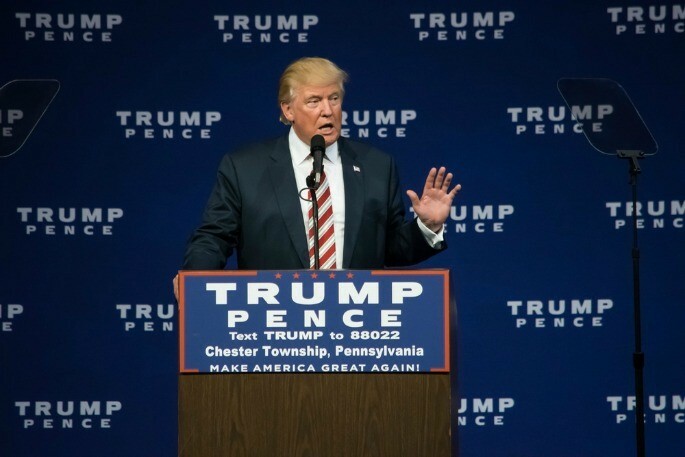 Donald Trump received an economics degree from the University of Pennsylvania in 1968 and took over the running of the family real estate and construction business in 1971. 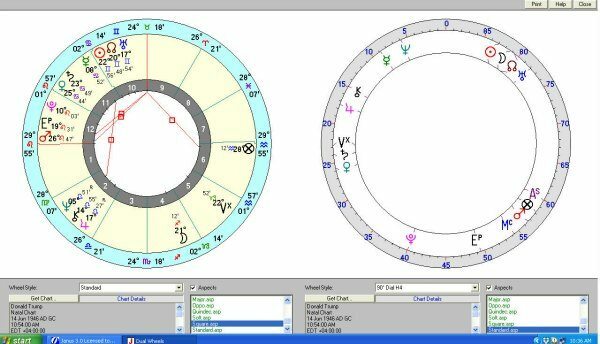 The second thing that indicated a win for Trump was the Solar Arc for 2016, as it was showing transiting Pluto to natal Jupiter across to Ascendant on Regulus (the royal star 29 Leo) to Solar Arc Sun. Ebertin in his book, “Combination of Stellar Influences,” explains this as the successful use of extraordinary physical and mental powers. There is also the progress Jupiter to Saturn indicating a change of residence and add to that a Jupiter return during this election campaign. Looking at the Inauguration chart there are some tough aspects. Mars and Saturn are to his natal Sun/Moon/Node would signify a great responsibility and the work acholic. Hilary Clinton would have also had a tough time if elected as her Moon is on this same degree. 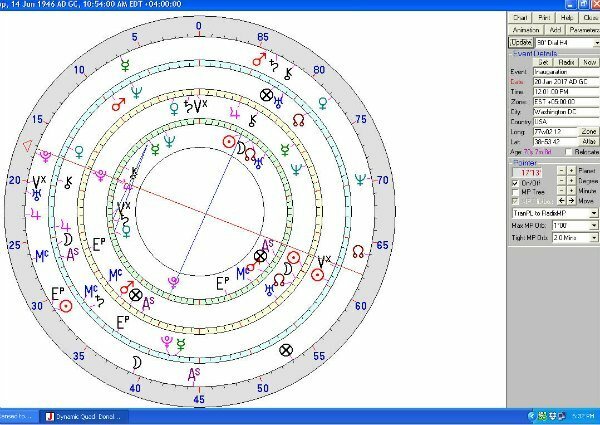 However; the one saving grace for Trump was transiting Pluto to his natal Jupiter which is attainment of leadership, speculating, and good prospects. Donald Trump will continue to court controversy as that is his nature. We all have to be careful we do not get caught in the web of Neptune in Pisces. Whilst it does give some beautiful spiritual moments it does have pathological tendencies and inclinations. Astute astrologers know that there are tough times ahead for the world economy. Maybe this man could be the one to help lead us out of troubled waters. One of his major statements was infrastructure and this much we do know, when people are out of work and hurting, big projects planned can help alleviate some of the stress and uprising that takes place under hardship. During the 1930’s great depression US built the Hoover dam. This was a huge project. In the 1950’s when things were tough, Australia instigated the Snowy River Scheme which bought many migrants to our country. Already we have heard Gt Britain announce a plan over twenty years with tens of millions of dollars for refurbishing the palaces of Britain. And of course Donald Trump plan to build a wall between the US and Mexico, which would supply many jobs. We will look forward to the future and see what happens over the next few years. Australians have long since forgotten that we had our own Donald Trump in the 1980’s when Bob Hawke came into power. He, like Trump had a flawed personality but in the end he became one of our longest serving and most loved Prime Ministers. Hawke came into parliament from a union background and like a lightening bolt was given a safe seat and then after the election went straight onto the shadow front bench. The then Prime Minister, Malcolm Fraser called a snap election in March 1983. Bob Hawke challenged Bill Hayden for the Labour leadership which he won becoming our 23rd Prime Minister and the rest as they say in the classics is history. Cosmobiology is playing in the deep and can be used for anything and everything. But just remember in the scheme of things, it is just another astrological system. Doris Greaves, my fabulous teacher, mentor and friend always reminded us, use whatever system you like, as long as it works for you.